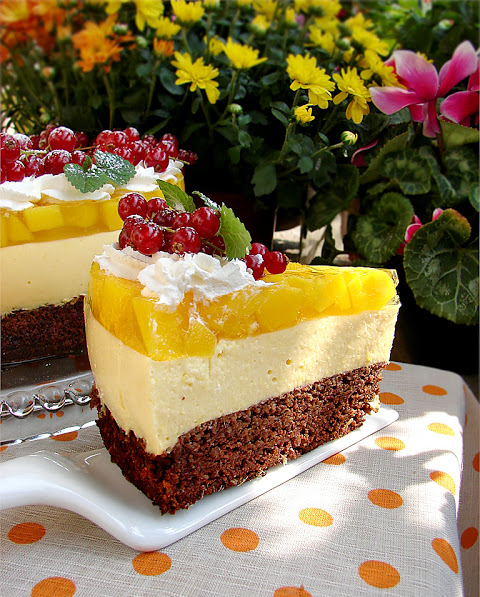 An interesting decision to create a cake with walnuts and mangoes for my grown-up children. For swamps break oil and sugar into a fluffy cream. Add yolks, cocoa, brandy, vanilla and walnuts. Grind the proteins into hard snow and gently add them to the cocoa mixture. Place the bottom of a tortilla shape with baking paper. Pour the dough inside, smooth and bake in a preheated 180 * oven. Let the swamps cool down well. For cream, stir cottage cheese together with cream and sugar. No mixer is needed if the curd is really fine. If it’s grainy, rub it first through a strainer or paste it with a blender. Season with vanilla and bark and lemon juice. Peel the mango and cut it into pieces. Pass it to puree and pour it into the cream. Stop the gel in a water bath in some water and pour it into the cream. Mix everything very well. Put the chocolate marsh in a cake and pinch it with the ring of the cake shape. 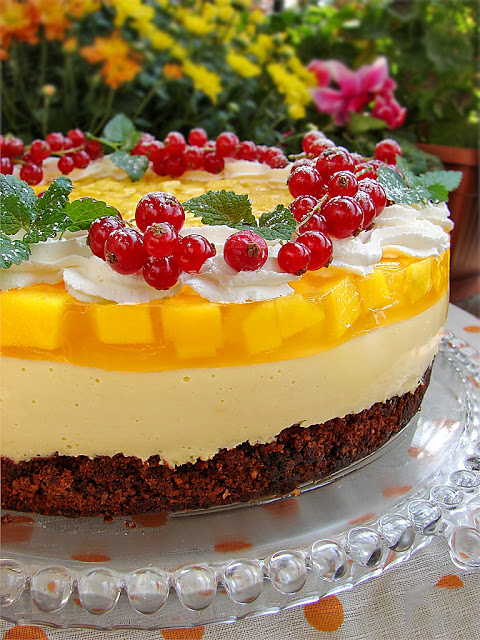 Pour the mango cream over it and let the cake gel for several hours in the refrigerator. For glaze peel the mango and cut it into cubes. In a small pot, mix it with water, sugar and lemon juice. Bring everything in 1-2 minutes. While the mixture is still hot, drain inside the gelatin and stir until it dissolves. Allow the glaze to cool completely. Remove the cake from the refrigerator and pour the icing on the cream. Again put it in cold to get it too. Remove the ring from the jelly cake and decorate with whipped cream and a little red fruit for contrast. Refresh with a fresh mint. Enjoy!